Small town America used to be ubiquitous. Even if you are fortunate enough to live in a small town, it has probably changed for the worse over the years. The Wal-Mart just outside the town might have made Main Street a sad and mostly boarded up place. Or you could live in a small city like this one where the principle industry went elsewhere leaving behind a poor tax base and lots of boarded up houses. So when you find an authentic and healthy small town in America today that feels kind of like Mayberry, it should be noted. My wife and I rediscovered small town America by spending a night in Buffalo, Wyoming, population three thousand or so as well as the Johnson County seat. I picked Buffalo as a place to spend the night on our vacation because we had planned our day around visiting Devil’s Tower National Monument in northeastern Wyoming. Devil’s Tower was so worth the trip, but finding a good place to stay near Devil’s Tower was next to impossible unless you had an RV. So instead we chose to drive two hours to its west, to the town of Buffalo, and sleep there instead. Buffalo is an eastern gateway into Yellowstone National Park. The Bighorn Mountains frame its western horizon. The aptly named Clear Creek runs through the center of town. Its clean and abundant mountain waters doubtless made it a logical center for commerce in the area. Our destination was The Occidental Hotel on Main Street. To call it just a hotel is to give it short shrift. It is a hotel, a saloon, a fine dining establishment and perhaps most importantly something of a private museum. The hotel was actually constructed in the 19th century. Among its early guests were the western notables Calamity Jane, Butch Cassidy, The Sundance Kid and Buffalo Bill Cody. No less than two U.S. presidents have also slept in the Occidental Hotel. You can find and sleep in Teddy Roosevelt’s suite on the upper level, or if you prefer sleep in the somewhat humbler Herbert Hoover Suite on its lower level. We chose the Herbert Hoover Suite. Hoover is infamous as the president at the start of The Great Depression, so perhaps sleeping in his room was not that great a privilege. He was campaigning for reelection in Wyoming when he arrived at The Occidental Hotel in 1932. In the room you can see pictures of him somewhat overweight and in a full suit and tie. It was a strange experience to spend a night in a room inhabited, however briefly, by a president of the United States. The original claw footed bathtub is still there, so I stripped and showered in the same place as a U.S. president. I am sure the bed has been replaced since the 1930s but presumably we were sleeping in the same spot as President Hoover as well. The room, like all the rooms in the hotel, feels very early 20th century. Our room came complete with a number of old books, including a book about “The World War”, which when it was published meant World War One. Inside it was a letter postmarked in 1918 from the original owner of the hotel. This, the old fashioned radio, the antique furniture, and the ancient wooden flooring that creaked under you as you walked on it made it feel absolutely authentic which, in fact, it was. The room’s only defect was its walls, which were authentically wooden with no soundproofing. Fortunately by ten p.m. the hotel had quieted down. This and my silicon earplugs ensured that my sleep would be undisturbed. The hotel sells its history and ambiance as well as a night’s rest. The clerks behind the counter are exceptionally friendly. In the hotel lobby, rife with antique furniture, you can play a game of chess or gaze at the many stuffed animal heads on its walls. Pre-ragtime music sounding like it came off a Victrola can be heard overhead. The hallways abound with vintage pictures and historical documents, most of them marking events of notables staying at the hotel. A trip into the adjoining saloon reveals the hotel’s likely naughty past. A large painting of a naked woman hangs on the wall. Perhaps she was a naughty lady of the house that could be found in many western hotels and saloons in the 19th century. Today the saloon attracts a higher class of clientele, who principally are guests of the hotel. Its counters and floors gleam. In a room in the back is a pool table that might have been heavily used a century ago. Next to the saloon is The Virginian, a restaurant affiliated with the hotel, which is doubtless the best dining available in Buffalo, and probably within a hundred miles. My wife and I enjoyed steak dinners in our own private dining alcove. Appropriately, my wife chose a buffalo steak. On the hotel’s patio are two sets of rocking chairs where you can enjoy watching life on Main Street pass by. You can hear Clear Creek babbling to your right. During the evening, horse drawn carriage rides are available for a modest fee, which you can conveniently board at the hotel. Or you can amble up and down its considerable Main Street, stopping if you wish at a local ice cream parlor. The closest thing you will find to a chain store on Main Street in Buffalo is a Rexall Drug. In the evening you may notice, as we did, an owl perched on the top of the court house. The character of Buffalo is borne out simply by crossing the street. Motorists will happily stop to let you cross, even if you are jaywalking. Eat breakfast as we did at the Main Street Diner and you may find a kindly local willing to move a seat down on the counter to make room for you. The Main Street Diner, like the Occidental Hotel, is an experience that should not to be missed. Behind the counter are four very hard working people serving twenty to thirty patrons. Our young blonde waitress was efficient, pleasant and personable. I found her interesting to observe, her hands constantly in motion as she orchestrated the complex process of serving all the patrons, managing the counters, calculating all the tabs (on paper) and processing all the payments. If you like getting great value for your money, you will find it at The Main Street Diner. The portions are beyond enormous. I ordered a western omelet, to find fully stretched across an enormous plate, along with toast and hash browns hanging on the side. It was good but I only ate half of it, certain I was already consuming far more fat and calories than I should. Perhaps the portions were sized assuming you were going to spend the rest of the day roping steers rather than driving a rental car. 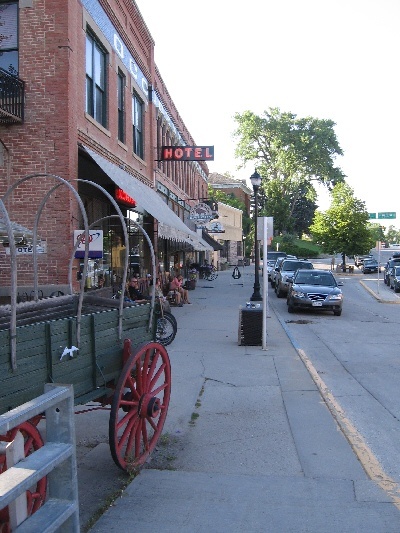 In short, our brief stay in Buffalo, Wyoming made us wish we had booked a second night at The Occidental Hotel. To me, if felt very much like I was in a time warp. From the nearby City Hall to the county courthouse built in 1886 next door, to the elegant grand hotel itself, to the babbling brook, to the nostalgic diner on Main Street, it struck a resonant chord of comfort in my heart. I did not find Sheriff Taylor or Floyd’s Barber Shop, but perhaps I did not look hard enough. However, I did find boys biking along Main Street, blissfully unaware of how special their authentic small town experience actually was. If you were to drop Mayberry somewhere in the West, you would most likely find it in Buffalo. I feel like I left some part of my heart in the town, and I sure hope I live long enough to return for a proper and extended visit.